PDF To Excel Converter Premium Software from the developer worth $39.95 is undergoing FREE Giveaway for before 2012 March 1st. With this PDF To Excel Converter Premium Software, users can convert PDF documents to Excel (XLS) in batch mode, also PDF To Excel Converter Premium Software can automatically decrypt the conversion protected PDF files. This giveaway of PDF To Excel Converter Premium Software is 100% full functional, clean and free. Unlike other websites The Customize Windows never ask to Retweet nth times or force to subscribe for any Giveaways. Editable – Edit Your PDF Forms In MS Excel using this PDF To Excel Converter Premium Software. Easy – Convert PDF To Excel Document Just In Only 3 Clicks. Fast – New PDF To Excel Converter conversion engine, 160% faster than other Converter. Page Range – Convert Selected Pages of PDF document To Excel format using this PDF To Excel Converter Premium Software. Batch Mode – Convert HUNDREDS of PDF Files to Excel XLS at One Time. Duration: PDF To Excel Converter Premium Software is free up to March 1st, 2012. You can download PDF To Excel Converter Premium Software from developer’s website by clicking here. The original price of PDF To Excel Converter Premium Software is $39.95 USD each license, but all users are able to get the licenses of PDF To Excel Converter Premium Software before 2012 March 1st for free. Office workers often have to move data from a PDF document to Excel to make it editable. Copying and pasting figures from a large document is a time-consuming and complex process that many users wish they could avoid. PDF To Excel Converter Premium Software provides an easy to use interface that lets users convert PDF documents to Excel (XLS) on Windows platforms. The utility incorporates a powerful engine which produces the most accurate XLS documents 160% faster than any other PDF To Excel conversion software. 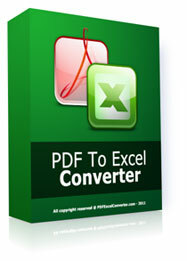 The usage of PDF To Excel Converter Premium Software is very simple. Drag and drop your PDF files onto the PDF To Excel Converter Premium Software converter’s file list, and then click on the “Start Converting Now” button. The conversion task will get started immediately. This Article Has Been Shared 4942 Times! Download paid or premium software for free as a part of Giveaway directly from the developers or Software distributors. PDF Converter PDFZilla Premium Software worth $49.95 is undergoing FREE Giveaway for 20 days. PDF To JPG Converter Premium Software from the developer worth $29.95 is undergoing FREE Giveaway for before 26th March, 2012. With this PDF To JPG Converter Premium Software, users can convert PDF documents to JPG, BMP, TIF, GIF and PNG Images formats. PDF To JPG Converter Premium Software from the developer worth $29.95 is undergoing FREE Giveaway up to June 30th, 2012. Web Hosting Giveaway with FREE Â£30 worth of Adwords credits, FREE $75 worth of Yahoo! credits is a luxurious giveaway to enjoy own server for one year free. Cite this article as: Abhishek Ghosh, "PDF To Excel Converter Premium Software worth $39.95 as FREE Giveaway," in The Customize Windows, February 12, 2012, April 20, 2019, https://thecustomizewindows.com/2012/02/pdf-to-excel-converter-premium-software-worth-39-95-as-free-giveaway-1/.